This regime, in Khartoum, is almost unfathomably evil. Led by President Field Marshal Umar Hassan Ahmad al-Bashir, it is a military dictatorship that is also Islamist and terroristic. According to Freedom House, the government of Sudan is the only one in the world today engaged in chattel slavery. Khartoum waged a long jihad  Bashirs word  against the south, featuring a terror-famine of the kind seen in Stalins Ukraine and Mengistus Ethiopia. . . . Sudan is so bad, it expresses an almost comic-book evil. In the southern genocide, one hospital was bombed five times; children were beheaded in front of their parents; the hungry were strafed as they gathered to await food drops. The government even ran a death train, in an almost willful imitation of the Nazis. 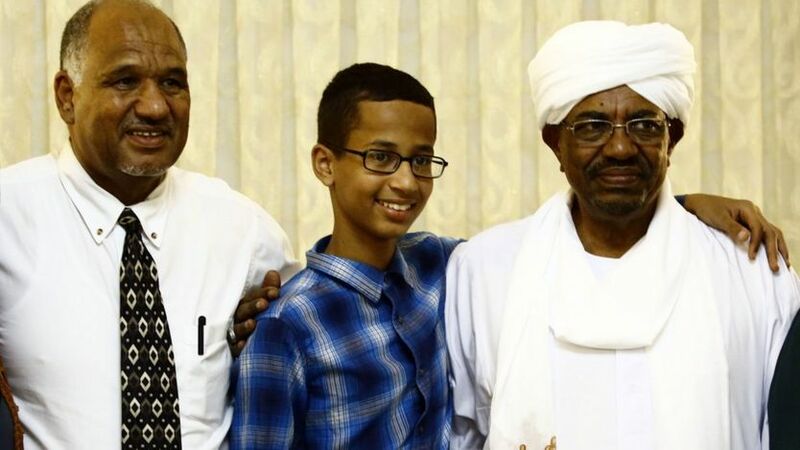 Apparently the elder Mr. Mohamed  who from his home in Dallas, Texas has launched two unsuccessful presidential bids against Bashir  did not think it in any way unseemly to have his family pal around with a mass murderer. And apparently, none of the Mohamed familys defenders in the media think so, either. Besides the Washington Post, no mainstream media outlets have yet mentioned the meeting, let alone condemned it. #share#Who is surprised? For those fixated on identity politics, Ahmeds detention was a nearly perfect tale: racial profiling, Islamophobia, a STEM-loving victim  and in the South! It mattered nothing that the tale grew steadily taller. The New York Times and CAIR and Hillary Clinton (et al.) had found a victim to serve their purposes. To an honest observer, it might be worth mentioning that that victim swaggers around with the monster responsible for 2.6 million victims. But when the story has been written, nothing can be allowed to upset it. From victims of sexual assault to victims of police brutality to victims of Islamophobia, the American Left choosing victims less according to reality than according to utility.  Ian Tuttle is a National Review Institute Buckley Fellow in Political Journalism. And to think this family was celebrated by the White House. Let him be known by the company he keeps. . . There, and in the White (Flag) House. Clockmed and his family are laughing all the way to the bank at how gullible and overwhelmed by adherence to the “narrative” politically-correct whites are ... and Suckerberg, Gates, and Obama are playing along with it to the hilt. Meeting with a Muslim mass-murderer just rubs it in all our faces even further at how much a “victim” can get away with. My girlfriend and I are ROTFLOAO. . . perfect. . . perhaps it would be more perfect, if such a thing were possible spelled "Clahkmed?" No? Maybe? “Clocked” was “Clockmed” until I hit POST. . . and then it suddenly changed to “Clocked” . . . damn it! Spell Check! Very chummy photo-op there with a genocidal criminal. I wonder if Clooney will make a statement, or if a journalist will ask Clooney about ‘Clockmed’s’ (great name!) photo-op with the Sudanese president. Omar got 94.05% of the vote, with 15 other candidates sharing the rest. Imagine that? Ahmed Mohamed (clock maker) meets with nephew of President Field Marshal Umar Hassan Ahmad al-Bashir (Butcher of Darfur) IN the White House on Monday. Well, at least the part about Ahmed Mohammed being at the White House on Monday is correct. Now lets see if the nephew is there too. "After bringing a clock to his Texas school on September 14, 2015, 14-year-old student Ahmed Mohamed was taken into police custody after a teacher suspected it looked like a bomb." "President Obama posted a Twitter message to the boy, inviting him to the White House: "Cool clock, Ahmed. Want to bring it to the White House? We should inspire more kids like you to like science. It's what makes America great." Obama Administration staff subsequently formally invited the student to attend the October 19, 2015 White House Astronomy Night." where did the alleged visit take place? If Clock Boy keeps visiting terrorists in the ME, he is going to return to America will a sore derriere. Son, congrats on your practice run on American schools. They’ll never know what hit them, Inshallah.